G. H. Law has recently opened a paint shop in the commodious quarters over Sidney Todd’s blacksmith shop on Military St.
New shop — G. H. Law has recently opened a paint shop in the commodious quarters over Sidney Todd’s blacksmith shop on Military St. Mr. Law has leased the quarters for a term of three years and is well equipped to do the best carriage and sleigh painting at moderate prices. Satisfaction guaranteed. Annual meeting — The annual meeting of the Houlton Woolen Mill was held Tuesday when the following officers were elected: President, J.W. Maxwell; First Vice President, C.H. Pierce; Second Vice President, S.H. Crawford; Secretary and Treasurer, C.A. Bagnall; Directors: J.W. Maxwell, Geo. S. Gentle, O.B. Buzzell, Chas. H. Fogg. Relocate — Fred A. Shean of Fort Kent, who decided some time ago to locate in Houlton, will arrive in town Saturday and continue the work of systematic accounting, that he started some time ago, already having opened new sets of books for different concerns. Guest speaker — Bernard E. Esters left tonight for Boston where he will be a speaker on the program of the midwinter meeting of the New Hampshire Press Association. He was accompanied by Nathan H. Solman, who will be in Boston for a few days on business. New position — Miss F. Bernice Bailey, who has been employed for the last two years at the Houlton Air Base in the Medical Department, has resigned her position there and accepted a position as bookkeeper in the Bangor & Aroostook Railroad office. Elected — Frank B. Dunn of the Dunn Furniture Company was elected president of the Houlton Regional Development Corporation during the annual meeting. Mr. Dunn will succeed Robert E. Anderson as president of the development group, and will serve a one-year term. New postmaster — The United States Senate last Friday confirmed the nomination of George E. McGillicuddy as permanent postmaster of Houlton. Mr. McGillicuddy has been acting postmaster since July 31, 1968, upon the retirement of Leo Spain. 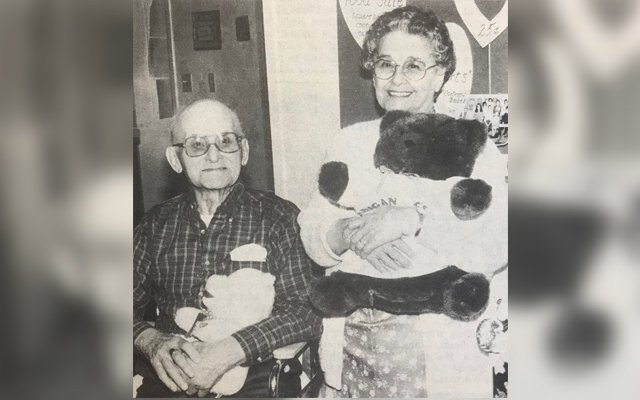 Married 70 years — Mr. and Mrs. Ralph E. Stitham of Monticello celebrated their 70th wedding anniversary on Dec. 26. Ralph and the former Laura Hersey were married at the Monticello Baptist Church by Rev. O.E. Thomas on Dec. 26, 1923. They reside at their home in Monticello and each celebrate birthdays in October, Laura, age 93, and Ralph, age 91. Geography bee winners — Southside School held its school-level competition of the National Geography Bee on Jan. 13. Beth Ludwig, congratulated the winner, David Brushett and Principal Joe Feeney congratulated the runner-up Andrew Thompson.